In Canada, when we think of “temporary workers,” the image that comes to mind is of the seasonal agricultural workers who have been toiling in our fields for the past 40 years, or the live-in nannies and maids from the Philippines. But these days, temporary foreign workers are found in all sectors: fast food, service stations, city bus drivers in Calgary, janitors in Edmonton, and even riggers on the CBC telecommunication towers in Montreal. Canada, a country with a reputation as a “land of immigrants,” appears to taking its cue from places like Hong Kong and Saudi Arabia, places that run on temporary foreign workers. 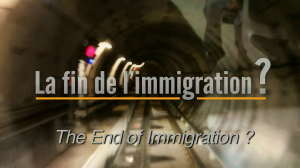 The documentary The End of Immigration? uncovers a trend which is having a major impact on the type of country in which we live, one that relies increasingly on “rent-a-workers” rather than immigrants, a process that could spell the end of immigration as we know it. Today, the number of temporary workers arriving each year in Canada far exceeds the number of immigrants. By comparing the situation of these temporary workers with that of their own parents who arrived in Canada as unskilled workers in the last century, the filmmakers uncover a hidden world that’s as close as the MacDonald’s on the corner. And they ask the crucial question: is this the kind of society we want to build? Filmed in collaboration with community groups, unions and advocates across Canada and internationally, The End of Immigration? takes the pulse of a movement challenging the system that turns workers into global commodities. Almost twenty years ago Marie Boti and Malcolm Guy started a series of three films about temporary migrant workers to Canada. One, Modern Heroes Modern Slaves, broadcast on CBC Witness, was awarded Best Investigative Documentary by the Canadian Association of Journalists. The films featured a particular program known today as the Live-In Caregiver Program (LCP) that brings in foreign domestic workers to Canada. Since then, this program has been widely challenged and exposed as discriminatory and open to abuse. When the Canadian government, rather than repealing the program, shifted recently to broadening its demand for temporary foreign workers, Boti and Guy felt compelled to come back to a subject they know well.